On a whim, I joined spring track my freshman year of high school. I was always an athlete, playing basketball, soccer, tennis, heck—even golf— for most of my life. So I thought I’d give myself a “break” from balls and racquets and considerable coordination and do track for a few months. I’d be a sprinter. Except that my coach made me run the 400m at my first meet. The 400 is technically still a sprint, but it’s a long one. One whole trip around the track. A quarter mile. It’s pretty much 350 meters longer than you’d ever want to sprint, and in my awkward running briefs, tanktop, and bulky sneakers, I got on the line and ran it in 71 seconds. Not terrifically fast. Spring track was mostly a blur, as I blindly fell in love with the sport. I didn’t feel much pressure since I was young and new, but I kept getting faster and breaking personal records, surprising my coaches while staying completely oblivious to time. Mostly, I enjoyed the people. Only a certain person voluntarily “runs for fun,” and our team was bound by this shared delirium that running is painful, and it’s hard, but it’s…oddly addicting and satisfying, and…fun. We’d sing songs on long runs, have rain dances when it’d pour, and treat ourselves to Paradise Pizza after a tough workout. 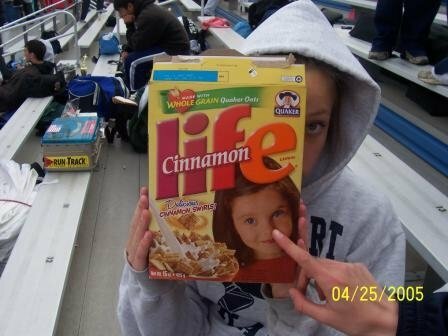 We’d dye sports bras and socks before big races, and eat boxes of LIFE on school buses before all-day meets. We all bought bright red spanex, too. I soon learned the big names in Suffolk County—Cummings, Sheffey, McDermott, Tschirhart—and slowly entered this secret, underground running world. I knew what 300m cut-downs meant (and that they were way harder than 200m cut-downs), I could feel paces, teach drills, dominate a fartlek, and measure my stride at the long-jump pit. I’d go on dyestat, and finally read Once a Runner, becoming engulfed in that 400m workout scene: amazingly epic, and terrifying. But let me tell you, that gift is hard to use well. Really hard. Expectations are created, but certainly not always met. Turns out 5K’s are way harder than 400-meter sprints, and I could barely finish a cross-country race without wanting to collapse. A horrible 800 leg in a Distance Medley Relay moved us from a 2nd place seed to an eighth place finish. I developed asthma and was hooked up to nebuilzers before races, I dropped batons, fouled on the long jump line, and sometimes… just ran slow. I knew which workouts to dread (mile repeats at 6:30 pace, hill repeats up Laurel Avenue) and when to freak out on race day (doubling in a back-to-back 4×800 and 4×400, or quadrupling with the triple and long jump). It’s actually incredibly easy to hate running, to lose patience, or to simply burn out. But it’s also terribly addicting, and naturally therapeutic. And besides, who needs drugs when running can make you high? It goes beyond that, though. Running changes people. Everyday I read about someone who picked up running and it changed their life. And it’s so incredibly empowering to know that you, yourself ran X miles—your legs carried you that far, at that speed. By now I’ve run thousands of miles. Thousands! That’s so cool. And it doesn’t matter how fast or how slow, it just matters that they happened, whether pounding on a treadmill or circling on a track, running through trails in the woods or dirt paths in Africa, through bustling streets in Manhattan or humid beaches in Puerto Rico. And your running relationship may change, which is totally okay. I was a mid-distance runner that would barely venture out for more than four miles. I retired my racing spikes (and competitive nature) and lost all my speed, learning how to simply enjoy the wide-open road, ditching my watch and just going. I’ve become my own teacher— disciplining and supporting, critiquing and congratulating. And it’s often the only time in the day when life is …just about me. Running both balances and challenges, exhausts and relaxes. It makes me sweat and think and release and work. But most importantly, it makes me appreciate my body that goes the length…. and my mind that allows it to happen. Posted on January 26, 2012, in Uncategorized. Bookmark the permalink. 3 Comments. Can somebody please still explain who the mystery man standing directly, and pretty much on top, of the back of my body is (and why) ????? I think runners can come up with a beettr one than that! C’mon guys let’s do our own by Fri before the race or Mon just after??? Like 10. You bought the coolest socks 2 days ago that are HELL on your feet right now. 9. You always get that bad feeling in your stomach (and guts) around mile 22. 8. Pre-celebration NY bagels and cheesecake let’s just come up with something fun! hahahaha that to me is still..a mystery. a very creepy one.